2020 Jeep Gladiator Review | Specs & Features | Gillette WY " "
The Jeep Gladiator is all-new to the lineup for 2020. It’s a pickup truck that matches the Jeep Wrangler in a number of ways. It’s rugged, comfortable, and capable of impressing with plenty of tech features. One of the first things that you’ll notice about the Gladiator is that it looks a lot like the Wrangler. There are a few differences, of course. The frame is 31 inches longer than the four-door Wrangler. The wheelbase is also 19.4 inches longer. It’s about 400 pounds heavier and has a five-foot bed on the back, too. The Gladiator has a windshield that folds down and a roof and doors that will come off. Choose from a total of four trim levels, including Sport, Sport S, Overland, and Rubicon. The engine that comes standard is a 285-horsepower V6 engine with a six-speed manual transmission. An eight-speed automatic transmission is also available. You’re sure to be impressed by the capability with its ability to tow 7650 pounds. The wide grille allows for greater air intake along with an upgraded cooling module. A class 4 hitch and two-inch receiver will make it easy for you to tow boats, RVs, and plenty of other things. There are two 4 x 4 systems available. The Command-Trac is the standard with a two-speed transfer case. The Rubicon comes with the Rock-Trac, which features heavy-duty axles and locking differentials. You’ll also find that the truck features 33-inch off-road tires, steel bumpers, a winch in the front, and plenty of lights to ensure that you can find the trail. Throughout the interior, there is plenty of space for passengers in the front and the back. The back seat also folds, giving you plenty of room for cargo. As for technology, you can look forward to a Uconnect infotainment system with an 8.4-inch touchscreen console. If you want to stay even more connected, it is Android Auto and Apple CarPlay compatible. The truck is ready for action on the highways and the dirt roads, especially with the safety features that will take good care of you in virtually any condition that you might encounter. 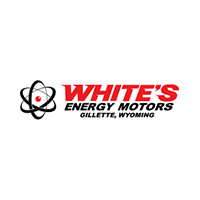 At White’s Energy Motors, you can see the Jeep Gladiator for yourself. We’d love for you to come down and take one for a test drive. Our staff members are here to take good care of you every step of the way. Visit or contact us today. One of our sales team members can show you the features of the Gladiator and answer any questions that you might have.